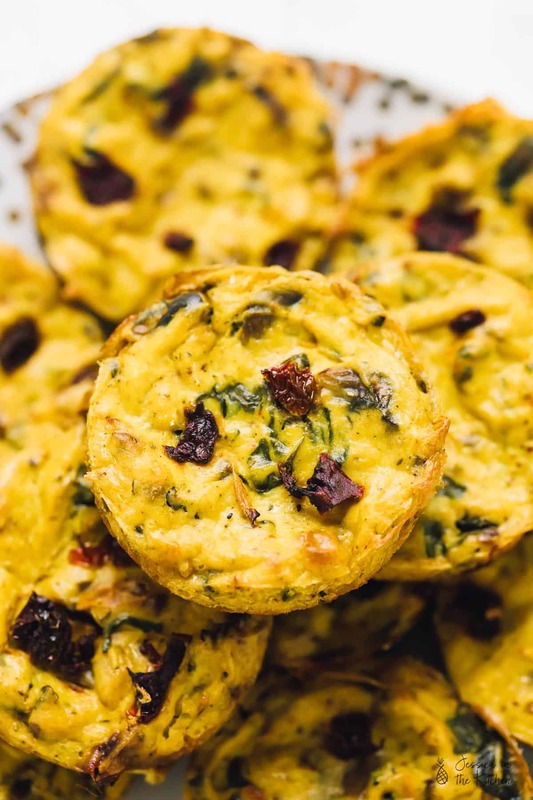 These Vegan Quiche Muffins Sun-Dried Tomatoes and Spinach are my current go to breakfast and lunchbox snack! 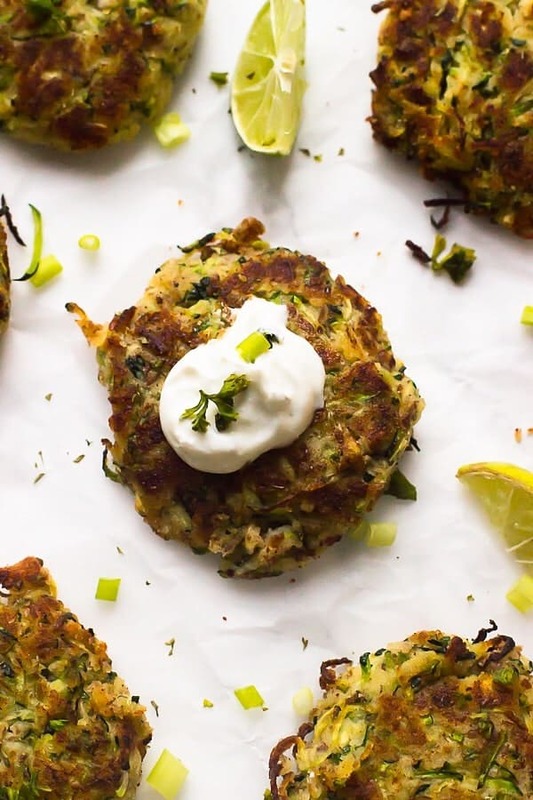 They are loaded with protein and so much flavour! Here’s a fun fact for you: When I was vegetarian, a nice large slice of quiche with a side salad was one of my favourite brunch/lunch options. The things I loved the most were the flavourful fillings and the eggy texture. In Jamaica we had Spinach Quiche but also had Callaloo Quiche – I love both so I always alternated between them. In fact, at my bridal shower there was Ackee quiche which completely blew my mind at how delicious it was. They are the perfect size for a quick and light breakfast. They are packed with delicious protein. You can switch up the fillings easily. I highly recommend keeping the sun-dried tomatoes though. I love how brine-y they are. I can see these out for appetisers or brunch. So versatile. 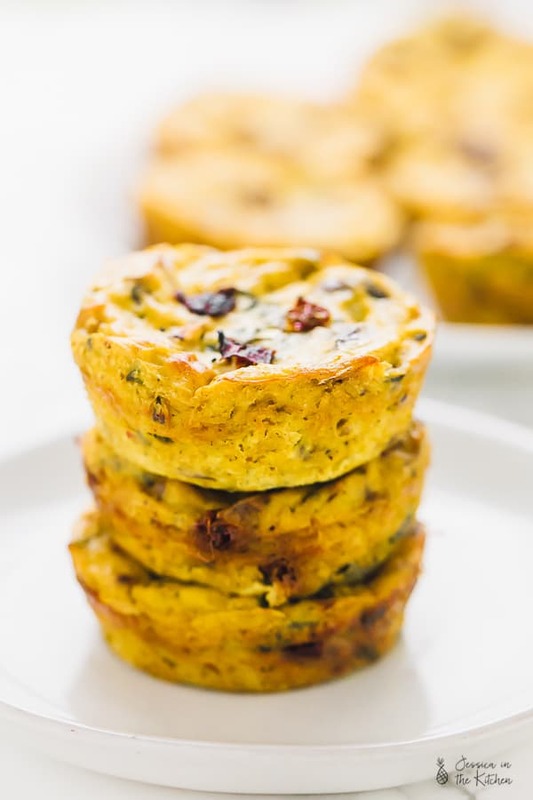 Long story short, these quiche muffins are bound to make your day. Gav couldn’t stop going on about how much they tasted exactly like eggs. You’re probably wondering – okay – what are they made with?! Tofu. YES, tofu. I was shocked too. I’ve always heard about using chickpea flour for these, but my first and last experience with it was terrible. I used a recipe for “scrambled eggs” with it and it was a gloopy mess. I plan to make my own one day, but for now, I wanted to stick with an ingredient I’m perfectly familiar with. You see, tofu takes on any flavour you give it. I think that’s why people are so wary of it because they don’t season it properly. Don’t skip on these beautiful seasonings. Every drop serves a purpose in transforming these. I also highly recommend blending these in the strongest blender that you own. You want to focus on the beautiful, smooth, eggy texture of these. 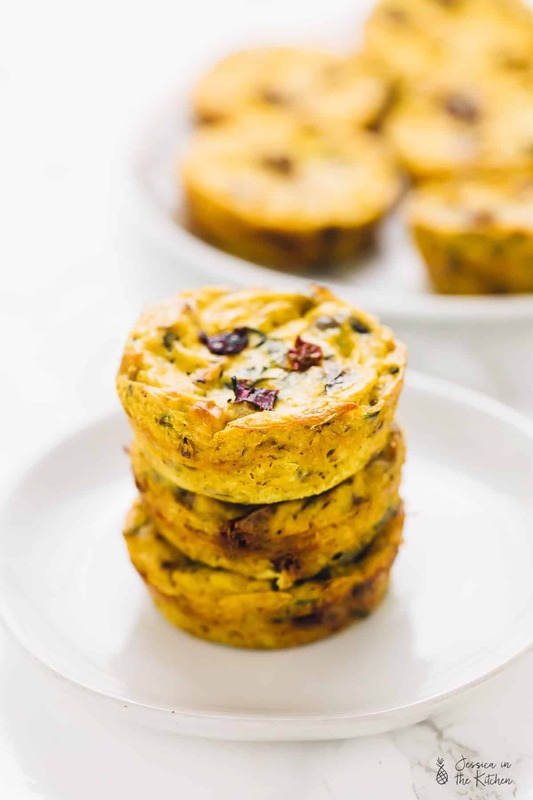 Lastly, these Vegan Quiche Muffins are amazing for meal prep. I mean, easy to prep, easy to bake, easy to store. 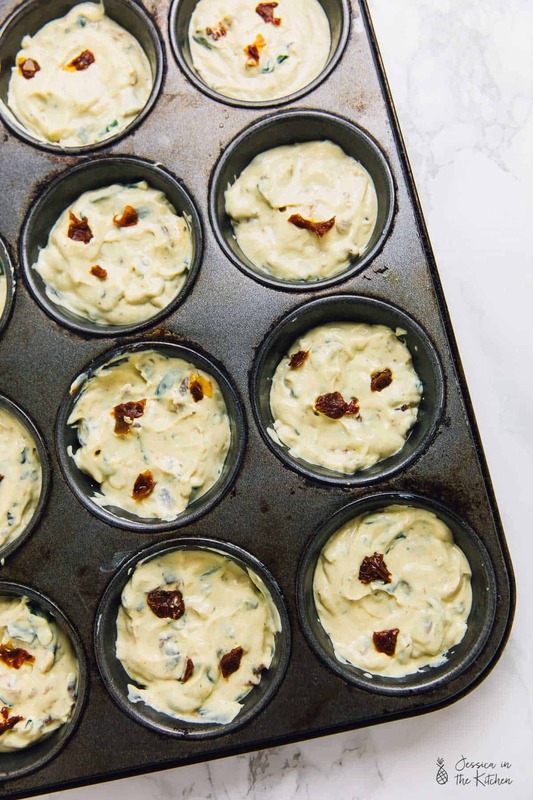 YES, you can freeze these Vegan Quiche Muffins too! Tofu always tastes better after freezing so rest assured it’ll work perfectly here. These have definitely re-ignited my love of breakfast foods and I plan to work to share even more with you. These are a beautiful start and I can’t wait to make a whole quiche for the upcoming holidays. Seems perfect for a breakfast or brunch or lunch (why not all three?). Preheat oven to 375°F/190°C. Begin to press your tofu and set aside until you are ready for it. Grease a 12-cup muffin container and set aside. In a pan over medium high heat, heat the coconut oil. Add in the mushrooms, spinach, garlic, onions, and 6 of the 7 sun-dried tomato halves, stirring to combine with the oil. Season lightly with salt and pepper to taste. Allow to cook through until the onions are translucent, spinach is shrivelled and mushrooms shrunken, about 5 to 8 minutes, stirring occasionally. Remove from heat and set aside. In a high powered blender, add the tofu, almond milk, nutritional yeast, sea salt and black pepper, turmeric, and baking powder. If you have any kala namak, add it now. Blend on high until everything is completely smooth and there are no lumps. I blended mine twice to ensure this. Stir in with a wooden spoon all of the fillings from the pan, plus the chives to combine. You can taste here and decide if you want any more nutritional yeast, or sea salt. Spoon out the mixture into 12 greased muffin cups, trying to get an even amount of toppings in each. Top each cup with the last of the sun-dried tomato half. Bake for 35 until quiche muffins until a toothpick stuck in the middle comes out mostly clean. Remove from oven and allow to rest for 5 minutes on the counter in pan. Then, loosen edges with a knife and remove onto a wire rack, so that they can cool completely without getting soggy. Serve while still warm, or while cold, and enjoy! *If you have a tofu press, don’t push it down all the way. If you’re using the books and paper towel method (wrap a tofu block in a few layers of paper towel or a kitchen towel then press with books), you only want to press for about 5-10 minutes, not much longer. Kala Namak is an Indian spice that adds a lovely eggy sulphur flavour to any vegan egg dishes. It is very powerful so only add a small pinch into your recipes. If you don’t have any, that’s also fine – it’s optional. I can’t have soy/tofu (or eggs). What substitutes do you recommend? For this recipe, there is no substitute. Perhaps you can try one of the soy-free vegan egg replacers (I think Follow your Heart just came out with one) on the market instead and follow a regular scrambled egg recipe. I hope that helps! Is that 1/4 cup mushrooms? It just says 1/4 chopped mushrooms. Recipe looks yummy! Thanks! Yes 1/4 cup but you can also weigh it out!! I hope you enjoy so much!! This looks really good! Is it possible to tell how many grams of protein there are in these? Hi Maria the serving size is about two per serving and that would give you about 9-10 grams of protein per serving. I hope this helps! Hi! Really want to make these, byt wondering how Michael “a block of tofu” is? We might not have the same size blocks in Sweden, and we have a lot of different size blocks. Thank you! Hi Josefin! You’re going to want to use about 1 pound/16 ounces of tofu for this recipe, I’ll note it above!